NEW: United Nations fears cholera outbreak could infect "tens of thousands"
Actor-activist Sean Penn talks about the cholera outbreak and other problems affecting Haiti on CNN's "AC360°" at 10 p.m. ET Monday. Port-Au-Prince, Haiti (CNN) -- Calling Haiti's cholera outbreak "an extremely serious situation," a United Nations official expressed concern Monday that the infectious disease that has already killed more than 250 people could spread and grow to "tens of thousands of cases." "It would be irresponsible to plan for anything but a considerably wider outbreak," said Nigel Fisher, U.N. humanitarian coordinator in Haiti. Officials with the Pan American Health Organization expressed similar concerns about the disease spreading to the Domincan Republic. "There is a very high risk that cholera will move to the other side of the island," said Dr. Jon K. Andrus, referring to the island of Hispaniola, which is shared by Haiti and the Dominican Republic. "There should be an island-wide approach on how to address cholera." The Pan American organization had "expected these cases," said Andrus, and "put in an early-warning system to watch out for these consequences, since the earthquake on January 12." That agency and others working to stem cholera in Haiti cite contaminated water as the source of the outbreak. Andrus said emphasis at this stage in the cholera outbreak should be put on personal hygiene, hand washing, and sanitation practices to help keep the public water system clean. He also said his organization had mobilized units to handle the burying and disposal of the dead. "As the clock ticks, another person is dying, but we need to look at the picture further down the road, as we attack this illness," Andrus said. Earlier on Monday, six new deaths from the cholera outbreak were confirmed by an aide to the Haitian health minister. The confirmed cases all originated in Artibonite, according to Dr. Alex Larsen, but officials are concerned about the deadly disease affecting Port-au-Prince, the country's capital, which is still recovering from January's massive earthquake. Several missionary and humanitarian groups have responded quickly to the outbreak to help keep it from spreading. CARE has medical teams working around the clock to treat patients in the affected area. "We also are working in Port-au-Prince, providing hygiene and water purification tablets," CARE spokesman Brian Feagans told CNN. Missionaries from Tennessee are also doing their part to help contain the cholera outbreak in nearby areas. "People are aware now; fears are there, but they don't know enough to understand the dangers," Andrea Brewer said Monday. Brewer and her husband, Mike, are with Reach Haiti, an organization from Tennessee. They're holding clinics in Croix des Bouquet, a northern suburb of Port-au-Prince, to try to teach people how to avoid the disease. On Thursday, the couple spent the day at a prison in Mirebalais, where sick prisoners had been transferred. A diagnosis for their illness was not given. "Many of the prisoners were laying in their own vomit and diarrhea," Brewer said, describing the area where she and her husband tried to treat the sick. "We didn't have any IV equipment," Brewer said. "We mixed some sugar, salt, water and Pedialyte and started giving it to everyone with syringes, since they were too weak to drink on their own." Later, Brewer said, a guard told her that at least three prisoners had died and a few others had been transferred to a hospital. She said she could not confirm cholera as the cause of death. Brewer also said she saw "long water lines of people waiting for drinking water" this past weekend as word began to spread across Haiti about the deadly outbreak. Meanwhile, an aid worker said it should be possible to keep cholera out of the Haitian capital, but the disease remains a major risk. The fast-moving outbreak has claimed at least 259 lives on the impoverished island nation, which is yet to recover from January's massive earthquake. Another 3,015 cases have been reported, according to Haiti's Health Ministry. Even if the disease can be kept out of Port-au-Prince, it remains a serious risk in the tent camps that are still home to tens of thousands of earthquake survivors, Erb warned. Aid workers are trying to educate people about the importance of hand-washing and clean water in preventing the spread of cholera, he said. 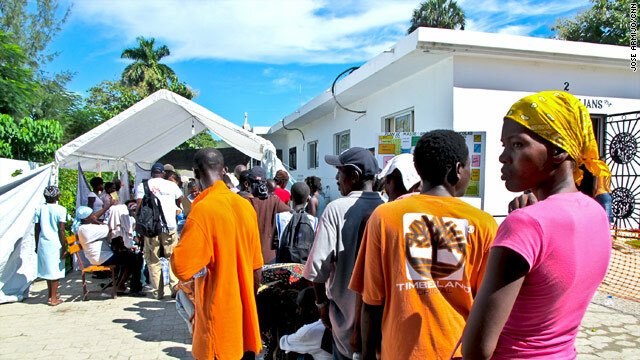 Five patients in Port-au-Prince were infected north of the Port-au-Prince in Artibonite, said Imogen Wall, spokeswoman for the U.N. Office for the Coordination of Humanitarian Affairs in Haiti. They traveled to the nation's main city, where health officials discovered them to be infected within the incubation period, she said. The five have been isolated and are receiving treatment, she said. But officials are stepping up sanitation efforts and setting up quarantine areas in Port-au-Prince. Authorities are bracing themselves for a possible larger outbreak nationwide. "I think the only responsible thing we can do at the moment is prepare and plan for the worst-case scenario," Wall said. She said aid organizations are working on constructing facilities to treat patients and sending more doctors to the affected areas. "We're all right for supplies ... but we're short on medical personnel," she said. The cholera outbreak comes after recent heavy rains caused the banks of the Artibonite River to overflow and flood the area. The river was dammed in 1956 to create Lac de Peligre and is Haiti's dominant drainage system. On Friday, officials with the U.S. Centers for Disease Control and Prevention and the U.S. Agency for International Development discussed efforts for a containment strategy on the outbreak. The CDC will send an 11-member team to Haiti over the next few days to find out which antibiotics will be most effective in treating the outbreak. USAID will provide supplies needed to set up treatment centers. The group already has 300,000 oral rehydration kits in position and is distributing water purification kits in affected areas. Cholera is caused by a bacterial infection of the intestines and, in severe cases, is characterized by diarrhea, vomiting and leg cramps, according to the CDC. In such cases, rapid loss of body fluids can lead to dehydration and shock. "Without treatment, death can occur within hours," the agency says. A person can get cholera by drinking water or eating food contaminated with the bacteria. During epidemics, the source of the contamination is often the feces of an infected person, and infections can spread rapidly in areas where there is poor sewage treatment and a lack of clean drinking water. Ian Rawson, director of Hospital Albert Schweitzer Haiti near Verrettes, said patients began showing choleralike symptoms on October 16. The pace picked up significantly Tuesday and beyond, though he said the situation was under control Friday at his 80-bed facility about 16 miles east of St. Marc. "So far, we've been able to manage it," Rawson said, noting that new patients were coming in via pickups about every 10 minutes. Temperatures in the mid-90s exacerbated the dual concerns about dehydration and people contracting cholera by drinking tainted water. People with buckets lined roadsides in and around villages, hoping that passers-by might have clean water, said Eric Lotz, Haiti's national director for the nonprofit Operation Blessing. CNN's Antoinette Campbell and Paula Newton contributed to this report.